Wishful thinking is not a solution. The world of work has changed, and the rate of change is increasing. 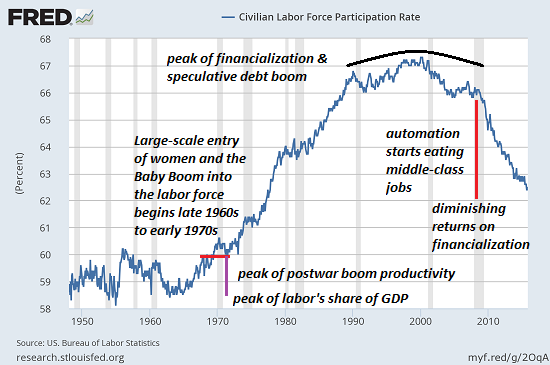 Despite the hopes of those who want to turn back the clock to the golden era of high-paying, low-skilled manufacturing jobs and an abundance of secure service-sector white collar jobs, history doesn't have a reverse gear (tm). 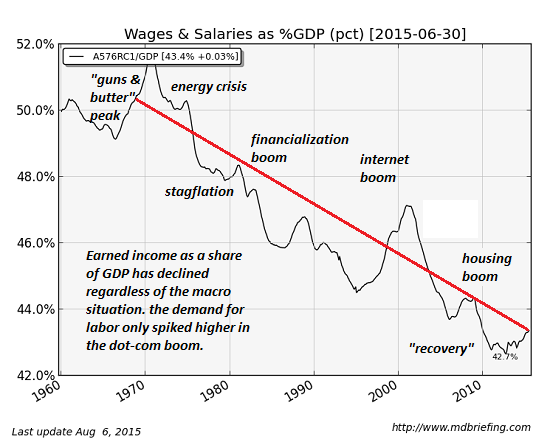 The world of work is never going back to the "good old days" of 1955, 1965, 1985, or 1995. 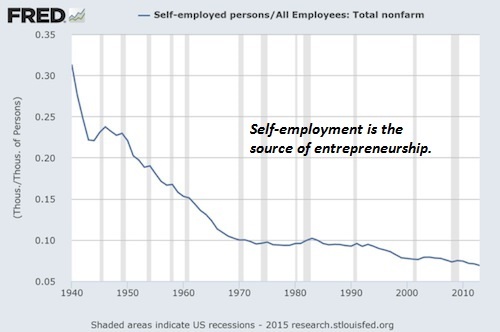 Jason Burack of Wall Street for Main St. and I discuss these trends in a new podcast, Radical Changes in the Job Market, Now & in the Future (47:37). 1. That automation will create more jobs than it destroys because that's what happened in the 1st and 2nd Industrial Revolutions. The wishful thinkers expect the Digital / 3rd Industrial Revolution to follow suite, but it won't: previous technological revolutions generated tens of millions of new low-skill jobs to replace the low-skill jobs that were lost to technology. 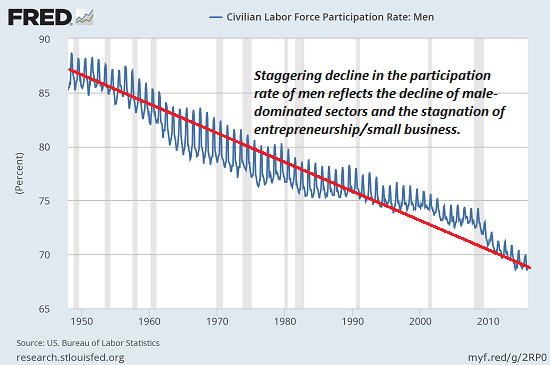 The Digital/3rd Industrial Revolution is not creating tens of millions of low-skill jobs, and it never will. Even worse for the wishful thinking crowd, the 3rd Digital Revolution is eating tech jobs along with the full spectrum of service-sector jobs. The new jobs that are being created are few in number and highly demanding.Jobs are no longer strictly traditional boss-employee; the real growth is in peer-to-peer collaboration and what I term hybrid work performed by Mobile Creatives, workers with highly developed technical/creative/social skillsets who are comfortable working with rapidly changing technologies, who enjoy constant learning and are highly adaptive. The work that is being created in the Digital/3rd Industrial Revolution is contingent and thus insecure. The only security that is attainable in fast-changing environments is the security offered by broad-based skillsets, great adaptability, a voracious appetite for new learning and a keenly developed set of "soft skills": communication, collaboration, self-management, etc. In short, we need a new system; wishful thinking isn't a solution. 2. That the U.S. can unilaterally demand the right to export its goods and services to others at full price while refusing to accept competing imports. In effect, the fantasy is to return to 1955, when the U.S. could export goods at full pop to the allies who were rebuilding their war-shattered economies. Imports were few because those economies were busy focusing on their own domestic needs. Trade is a two-way street. Fair trade is a moving target, depending on which side of the trade you happen to be on. Everybody wants to export their surplus at top prices, but competition lowers prices and profits. This forces global corporations to seek cost advantages by lowering the cost of components and labor. 3. The wishful thinkers want strong corporate profits to prop up their stock market and pension funds, but they don't want corporations to do what is necessary to reap strong profits, i.e. move production of commoditized goods and services overseas or replace human labor with cheaper automation. Wishful thinkers choose to ignore the reality that roughly half of all U.S. based global corporate sales and profits are reaped overseas. It makes zero financial sense to pay a U.S. worker $20/hour, and pay the insanely expensive costs of sickcare/"healthcare" in the U.S. when the work can be done closer to the actual markets for the goods and services at a fraction of the cost. 4. The wishful thinkers decry the lack of "good-paying" jobs yet they refuse to look at the reasons why employing people in the traditional boss/employee hierarchy no longer makes sense. The armchair pundits and ivory tower academics have never hired even one person with their own money. These protected privileged are living in a fantasy-world of academia, think tanks and foundations, where workers are paid with state money, grants, venture capital, etc. 5. We can solve the decline of the traditional work model with more education.This is also wishful thinking, as not only is higher education failing to produce workers with the requisite range of skills, the emphasis on higher education has produced an over-supply of people with college diplomas. 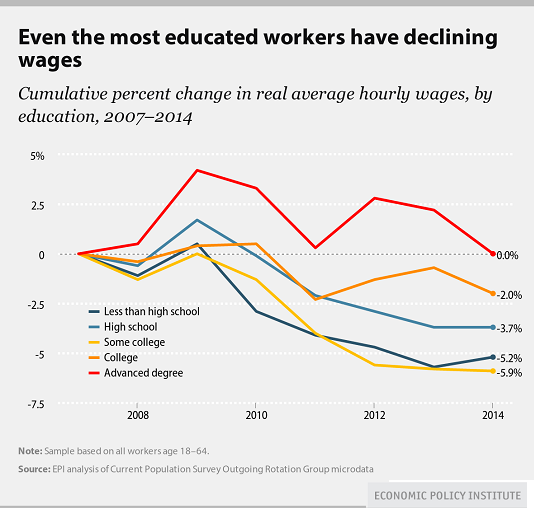 In the real world, even wages of the most highly educated are stagnating. Part-time jobs do not provide enough income to have an independent household or raise a family, nor do they pay enough taxes to fund the Savior State. 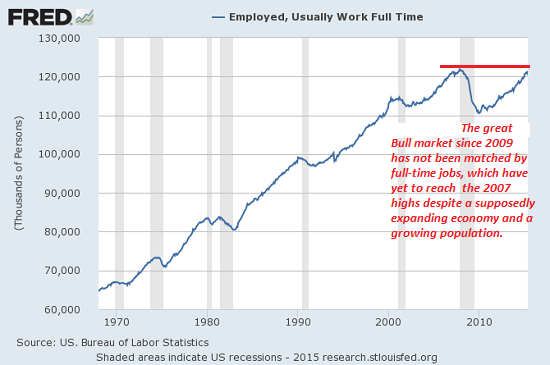 The only jobs that count are full-time jobs, and they haven't even returned to 2007 levels despite a higher GDP and a rising population. It's time to get real, people. Wishful thinking is not a solution. We need a new system for creating paid work and money, and here's my proposed alternative system: A Radically Beneficial World: Automation, Technology and Creating Jobs for All. Thank you, Curt A. ($20), for your most generous contribution to this site--I am greatly honored by your steadfast support and readership.